I love this. The photos are so adorable and I love the color scheme going on. 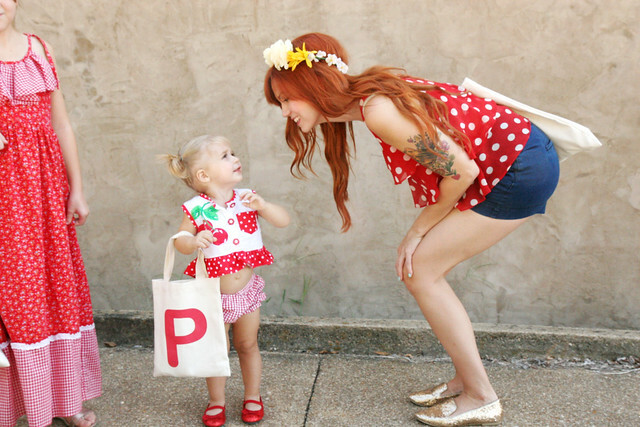 And I absolutely love the polka top red tank. Awwwie these are the cutest pictures ever!! And you three look so incredibly stylish and beautiful in your red dots. I hope the girls feel better by morning! Posey is the cutest creature I've ever seen. I hope I should be so lucky if I ever have babies. You guys look SOO freaking cute!! I love it!! This post totally made my night. So cute!! You all are adorable! I love all of your outfits and the polka dots are so great!! Seeing these adorable pics were such a great way to start the day! the mother daughter posts are definitely worth the effort! 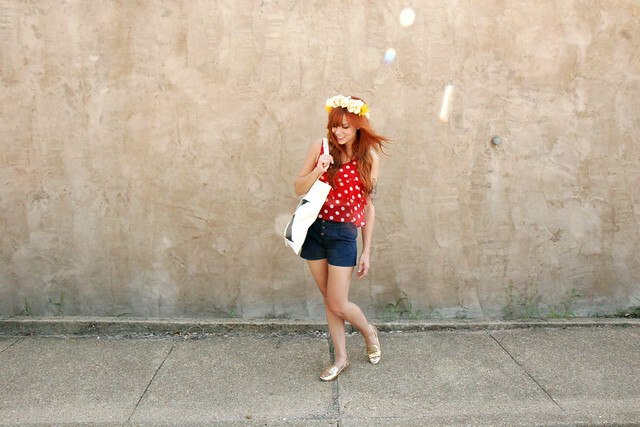 i love these posts, and how you create outfits and styles that mesh so perfectly together!! 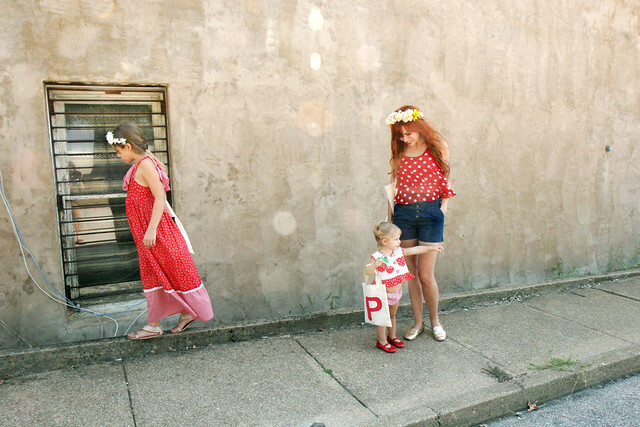 not to mention it's ALWAYS fun to see your girlies on the blog. And I hope your girls are feeling better already!! Hope they feel better...so sweet! No matter how embarrassing the shoots may get as the girls get older, it will be so worth it to have them and look back on them together. Cheers for mother daughters bonding time! Your flower crowns are gorgeous. Hope the girls feel better soon so they can enjoy the last little bit of summer! I officially need an alphabet bag! Those are so sweet! So adorable!!! 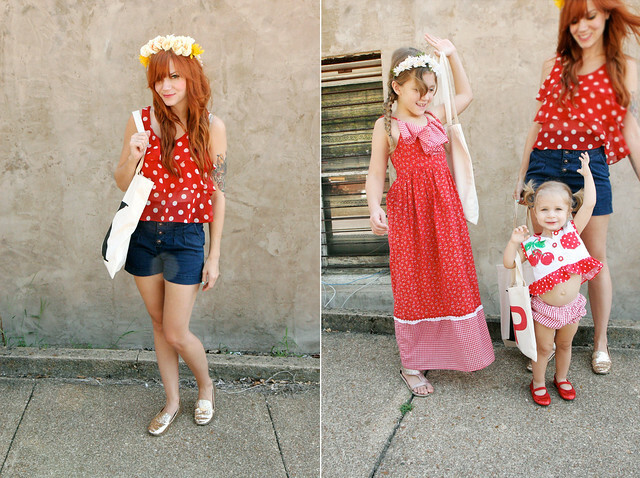 They will appreciate these someday for sure, I wish that I had pictures like this with my mom and sister. So adorable! I love the matching bags! Poesy's tiny little tote back is TOO CUTE!!! Oh Katie, you and your girls are precious! 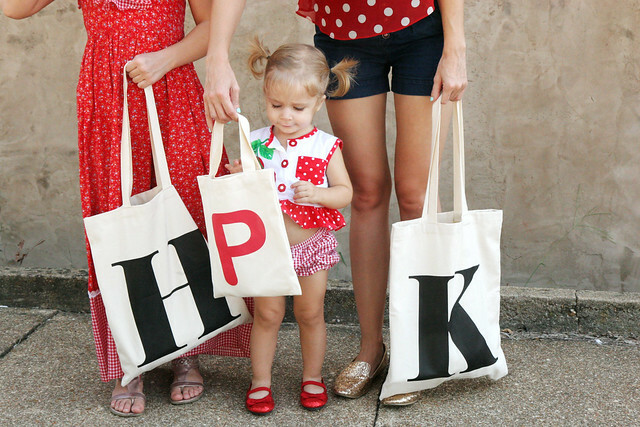 Love these outfits and the alphabet totes. These photos are so adorable, I hope the girls feel better soon. Hope your little ones heal from sickness soon. You all looked beautiful! oh my gosh these are too cute! love all the matching! Oh my Posie is just about the cutest thing I have EVER seen! These photos are the prettiest!! What a gorgeous family! Love these shots! I like how you obviously coordinate but aren't wearing the same thing. POLKA DOTS! <3 I love them. You're right! It's going to be great when you get to look back at these one day. You guys are the cutest!! Good lawd, it's like you're all straight out of central casting. :) Too cute! You'll have to compile the photos in a big coffee table book, what a keepsake they are. You have such a beautiful family! These posts are just so sweet. I love all your different, yet matching, styles. 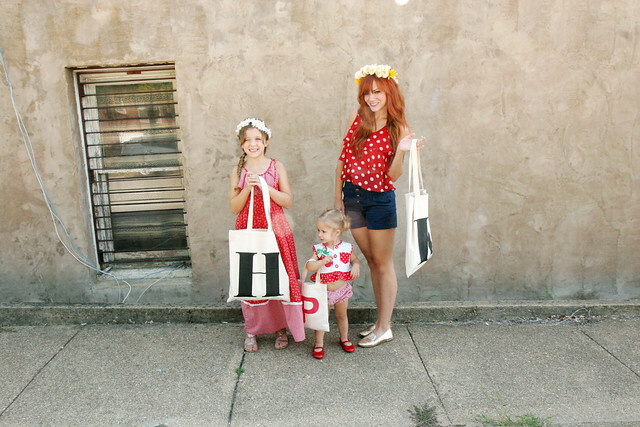 What an adorable little family, you girls are so pretty! I was a young mommy too, I guess I'm still considered one, lol. I'm 35 and my oldest is 16, almost 17 years old. I'm always the youngest at the PTA mettings, he he he. Anyways, you are a doll!